SAILING AIDS → CHARTS AND CRUISING GUIDES → RICHARDSONS LAKE HURON CHARTBOOK + CRUISING GUIDE, 7th Ed. 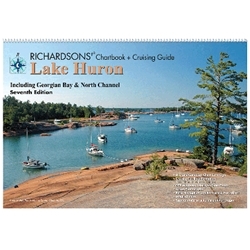 RICHARDSONS LAKE HURON CHARTBOOK + CRUISING GUIDE, 7th Ed. Includes: North Channel, Georgian Bay, west through the Straits of Mackinac, south to Sarnia, north to St. Joseph Island.